Origin of the Devotion: The practice of offering Gregorian Masses for the repose of the soul of a deceased person was started by Pope Saint Gregory the Great, who ruled the Church from 590 to 604. The event that started this pious practice took place while he was abbot of St. Andrew’s monastery in Rome, prior to his election to the papacy. In the fourth book of his Dialogues, St. Gregory relates how one of the monks of his monastery, named Justus, did not keep his vow of poverty very well. 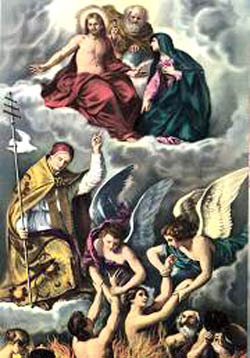 When Justus died, St. Gregory feared that the good monk might have to spend a long time in Purgatory because of his failures with regard to poverty. He therefore ordered that, the Holy Sacrifice of the Mass be offered up for Justus for thirty consecutive days. On the thirtieth day, Justus appeared to Copiosus, a brother monk, telling him that he was now freed from his sufferings because of the thirty Masses that St. Gregory had ordered to be said for him. 30 Consecutive Day Requirement: Gregorian Masses can be offered only for the dead, and only for one particular person. Gregorian Masses require that a Mass is offered daily for thirty (30) consecutive days for that deceased person. If this is interrupted, even on the twenty-ninth or thirtieth day, then the Masses must be started again. The Gregorian Masses impose a grave obligation on the priest accepting them and the reason why care must be taken in being willing to offer them. Stipend: The stipend for the thirty Masses is more than usual because of the added efficacy, obligation, risk and possibility of having to re-start the thirty Masses if necessity demands it. For requesting the Gregorian Masses online and with the traditional Latin Mass exclusively the stipend is $930.00. $900.00 is for the celebrant of the Mass which represents the donor’s gratitude for the priest’s dedication of the ministerial fruits of the Mass for the benefit of the deceased person in whose name the Gregorian Masses are offered. The stipend is not a payment for the Mass. The extra $30.00 is for online ordering and provides for the credit card and processing fees associated with the stipend for each of the thirty Masses. To save this extra $30.00, please mail the stipend for $900.00 with the name of the deceased person to us: Servants of the Holy Family, 8528 Kenosha Drive, Colorado Springs, Colorado 80908-5000. Name of the Deceased and Scheduling: In addition to the stipend, we need the name of your deceased and the freedom to schedule this set of Masses at our convenience as our schedule permits. Obviously, this is for the required period of thirty consecutive days. Thank you for your interest in requesting the offering of Gregorian Masses using the traditional Latin Mass and we accept requests for this purpose. You may enter the name of the deceased and other pertinent information once you add this to your cart.